A mouthful of a title...a la Dab ! 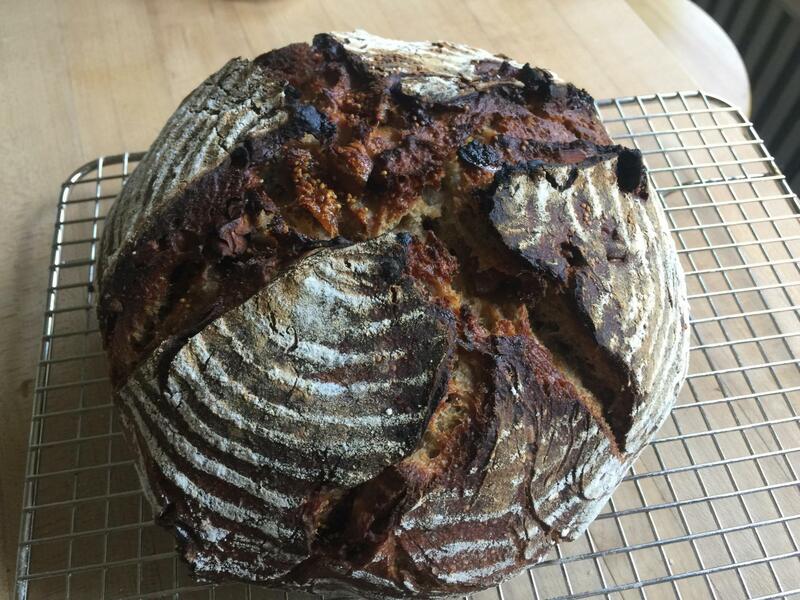 This bread has evolved considerably from my initial bakes based on Shaio Ping's posts. The only liquid in the bake is the banana puree. I use two levains just because. I add figs and pecans..well just because. The dough is pretty sticky but after letting it set a couple hours and doing a couple lamination folds it was like silk. I only did a short bulk ferment in a warm oven as it was getting late and I had started the whole process too late in the day. 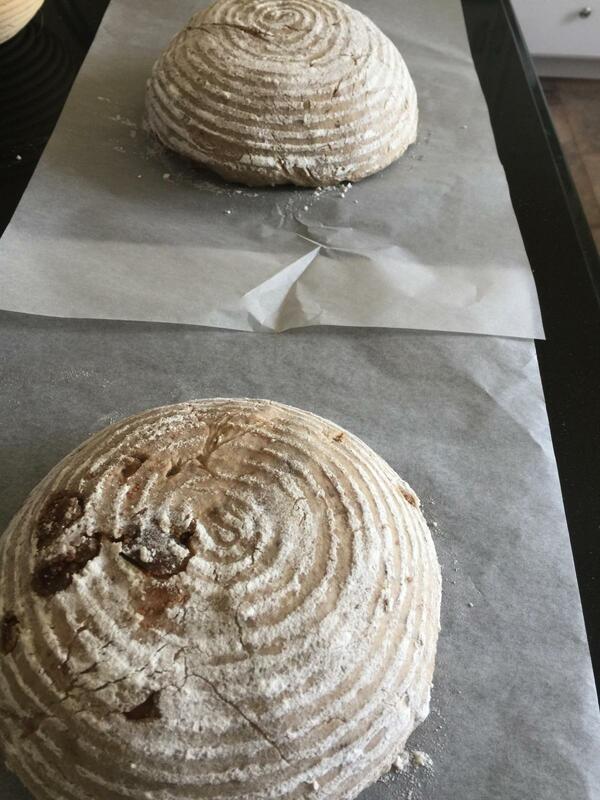 I divided and simply plopped them in lightly floured bannetons. Covered and placed in the fridge. Baked cold from the fridge with very little discernible rise overnight. The bloom of the crust is typical of my loaves with the free-style non-shaping. The first loaf got a little darker than I would have liked but I modified the temp and loaf 2 is perfect. The Fragrance is almost more than a body can stand what with the YW, bananas and the caramel of the figs. I used a LOT of soaked/chopped figs. Mix all but salt. Let set. Add salt by sprinkling on top of dough and spraying liberally with water. Cover. Let this all set at least one hour. Flour your board and your hands and pat out the dough to a very flat rectangle. Gently lift and stretch and fold like apple strudel. Do this again and then place in PAM sprayed bucket. Leave for 30 min and repeat. If dough not holding shape do a third time. should be very silky and extensible. Distribute the dried fruit and nuts on the last lamination. Place in warm spot and leave an hour or so till beginning to puff up...about 25% rise . Remove and shape. Place in fridge. After 12-15hr. Preheat pan and bake. I use my Granite roaster and only do a short pre-heat at 500 just till oven is ready. Bake 10 min 500, 10min 475 ( modified for second bake and used 465) remove lid and bake 20-30 min more till 210 or so. Will post crumb tomorrow if I can wait that long ! crumb:tastes lie the creamiest fig bread pudding ever! with a caramelized crust its almost too good! Now, that's a banana bread! You didn't weigh the figs? I use up to 40% if they are the only solid ingredient. Half that, if nuts are also used. I love how it cracked and how it's dark. My mouth waters just by imagining the flavor with lots of dates! YW and SD. Sounds insane but it bet it tastes as grand as it looks! Really nice serendipity and happy baking going on there for sure! 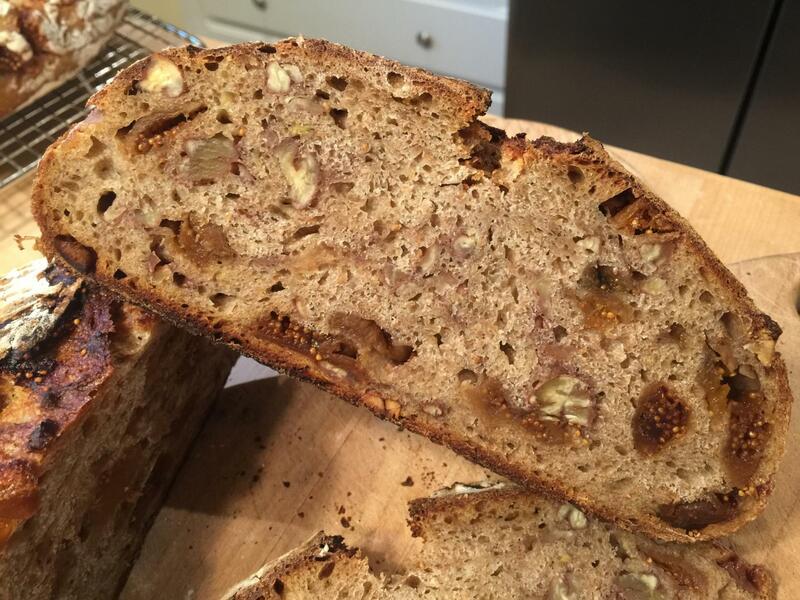 You made "true" banana bread! That's a lot of banana and figs, no wonder it smelled so nice. The dough structure I end up with having is usually pretty poor when much fruit/vegetable puree is subbed for water. Yours seemed to stay strong and tall so it's a very successful bake! That is an absolutely mouth watering loaf of bread, Caroline. Lightly toasted, with a schmear of cream cheese, it would make a breakfast all by itself. Beautimous! i ate way to much of it after the first slice! The second boule weighed 1057 g after baking !!! Yikes. That is a LOT of figs and pecans. The first boule was smaller though I didn’t weight it. Next time😊. A nice fall baking, opening the season? our horrible heat has given way to foggy chilly mornings! Even though the first day of Fall is a ways off it truly feels like Summer is over. The kids started school yesterday in our town so their Summer is complete. Looks amazing Cathy!! I love banana bread (can't stand raw bananas though!) And thus is banana bread in the truest sense of the word! Did the dough feel like regular dough made with water? I should sign my whole name it's Caroline :) Yes the dough feels just the same as with plain water. It is pretty sticky to start with due to the rye but it smooths out really well on the floured board using the lamination technique instead of stretch and fold. It tastes amazing ! 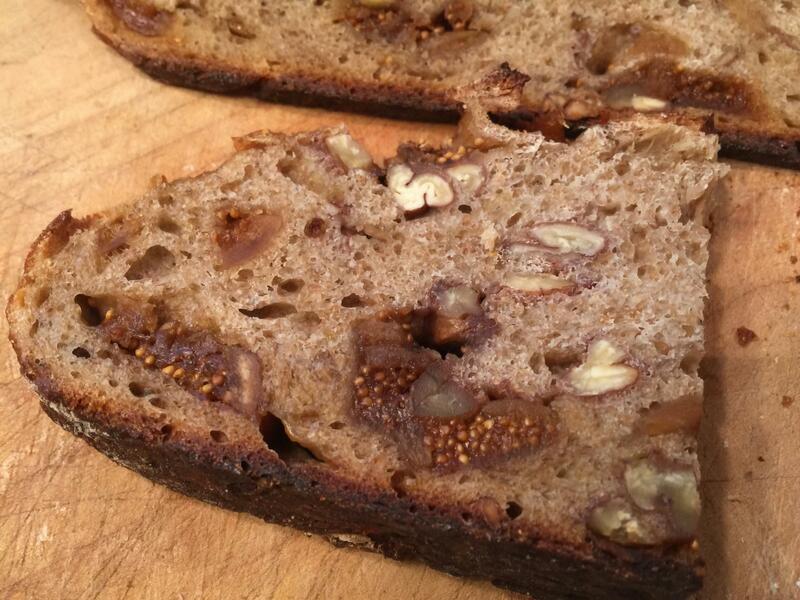 Very rich and caramel and yet a decidedly moist crumb bread texture as well . You have outdone yourself on this one! I can smell that amazing aroma all the way over on Long Island! I bet this would be good with dates in place of the figs as well. So how did the banana flavor come through? Crust and crumb look perfect. if you look back the first time I made this I used dates and pecans. It was great . But this surpasses that one by miles! Not sure why other than more attention to timing of the dough. In reality this had so little fermentation time both bulk and shaped that I have no idea why it turned out so amazingly! I love figs! These were well hydrated by misting with cold water and tossing them in a bowl. My new fave way. The banana flavor is quite pronounced. I don’t think you can use banana YW except in a bread where you want to taste it. Apple disappears and so does raisin etc.